Toronto, Ontario--(Newsfile Corp. - September 18, 2018) - Appia Energy Corp. (CSE: API) (OTCQB: APAAF) (FSE: A0I.F) (FSE: A0I.MU) (FSE: A0I.BE) (the "Company" or "Appia) is pleased to provide geochemical assay results from surface channel samples collected from the Charles zone as part of the on-going exploration program (the "Program") being carried out on the Alces Lake Property (the "Property") in northern Saskatchewan. Surface channel sample geochemical assay results for the Charles zone are provided in Table 1. The highest results were obtained along line 14 (see Figure 1) which returned 14.90 wt% total rare earth oxides ("TREO") over 5.1 m. Other notable results include 9.859 wt% TREO over 3.1 m from line 17, and 7.568 wt% TREO over 4.0 m from line 13. Eleven of the 18 lines (or 61%) with REO mineralization had grades considered to be "high-grade" REOs (see Table 1). A total of 22 lines were sampled, with 221 samples collected from the lines. Lines were spaced approximately 2.0 m apart. Mr. James Sykes, Vice President of Exploration and Development for Appia comments: "The results from the Charles zone continue to highlight the high-grade rare earth element ("REE") potential of the Property. The surface work of the Program has provided valuable geological insights that could help Appia identify areas of potential, additional subsurface rare earth oxide mineralization." Overburden stripping and the collection of systematic channel samples were taken from all seven exposed zones and have been hand delivered to the Saskatchewan Research Council's ("SRC") Geoanalytical Laboratory, an ISO/IEC 17025:2005 (CAN-P-4E) certified laboratory in Saskatoon, SK for multi-element and REE analysis using the Whole—Rock and Rare Earth Element Lab Packages. The Rare Earth Element analysis uses a lithium metaborate fusion to dissolve refractory minerals such as monazite. Diamond drilling into the zones is currently underway and will continue through the current month of September. The results from the analyses of all the samples collected from these zones will be reported as they become available. 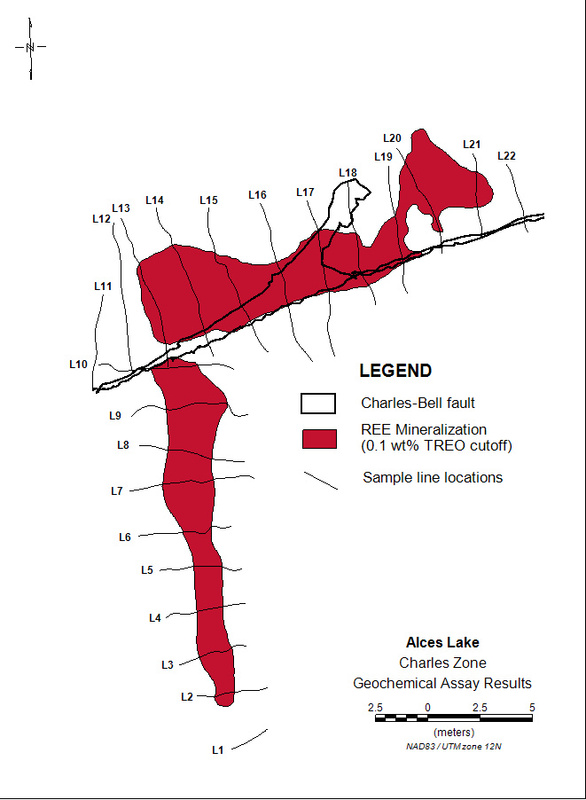 The Alces Lake Property encompasses some of the highest-grade total and critical REE mineralization in the world, hosted within seven surface showings that remain open in all directions (see *Note below). Critical rare earth elements are defined here as those that are in short-supply and high-demand for use in permanent magnets and modern electronic applications (i.e: Neodymium (Nd), Praseodymium (Pr) and Dysprosium (Dy)). The Alces Lake project area is 14,334 hectares (35,420 acres) in size. All geochemical results reported herein have passed rigorous internal QAQC review and compilation.The technical content in this news release was reviewed and approved by Thomas Skimming, P.Eng, a Director of Appia, and a Qualified Person as defined by National Instrument 43-101.